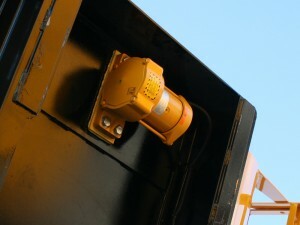 Rugged and economical DC Truck Vibrators provide power to improve the speed and efficiency of unloading dump trucks and other mobile equipment. Models are available to suit your truck and your typical load. Up to 3200 pounds of vibratory force to improve the unloading of wet, sticky, fibrous or even frozen material. Small, lightweight units require minimal space. Weather-proof aluminum housing provides high output to weight ratio. Sealed ball bearings eliminate lubrication requirements. Supplied with mounting hardware and electrical connections. Sealed ball bearings are permanently lubricated. Choose from 12- or 24-volt motor; models match force to output requirements.